In the world of internet marketing, there is one thing that everyone needs to become successful and that is traffic. Without traffic, you will not gain subscribers to your mailing list, make sales for your products, get adsense clicks or anything else you wish to achieve from your website. Without traffic, you have no business and certainly no income coming in. And there’s where Sharelock comes in to help you. As you may already know, viral marketing relies heavily on word of mouth marketing. There is no limit on the amount of traffic you will get as you wouldn’t have known how many people are spreading the message for you. Most people are curious, if they receive the message from somebody they know or trust, they are most likely eager to find out what’s the “buzz” behind. One of the most common technique to go viral is giving something for free. But why not giving something premium for free but with an extra challenge. In fact people loves challenge. Very easy and straight forward to install. Easy to use by using simple Shortcode. Hide partial or all of your content in Posts or Pages. You can decide how many visitors target to unlock your content. Have multiple locked content with individual visitors target in one post or page. Your locked content will not shown in Source View. Highly customizable lock’s information box. 5 prebuild themes to select to. Create your own theme with theme editor. Using Ip Address and cookie to detect returning visitors. 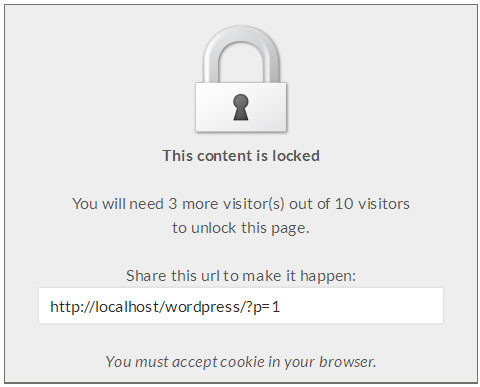 Counter will not change if visitors disabled cookie in their browser. Wordpress 3.8 (older versions may work but they have not been tested). Unfortunately Sharelock may not work correctly under CDN and or Cache system. You may try to lower the cached time to under 1 minute but it will occasionally gives you the wrong counter. To lock a content all you have to do is just wrap your lockable content with Sharelock shortcode. 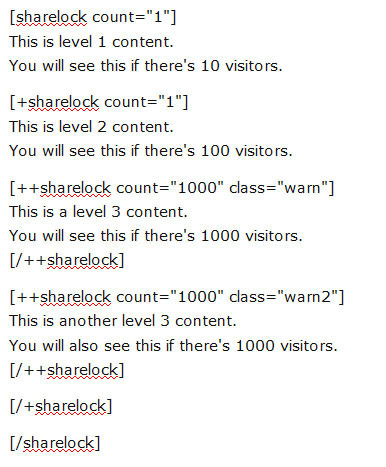 You can have another locked content inside a locked content, up to 3 levels deep. This is level 1 content. You will see this if there's 10 visitors. This is level 2 content. You will see this if there's 100 visitors. This is a level 3 content. You will see this if there's 1000 visitors. This is another level 3 content. You will also see this if there's 1000 visitors.